Like other types of mechanical equipment, heating and cooling systems require regular maintenance to remain efficient, prevent the need for major repairs, and extend their life. Like a car, the components within HVAC system need to be inspected, cleaned and adjusted as they experience wear with use and time. 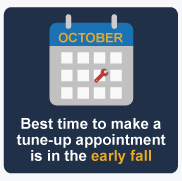 While you may schedule a professional HVAC tune-up any time of the year, one of the best times to make an appointment is in the early fall because it will help ensure your system remains reliable through the upcoming cold months. Stay warm throughout the cold months: Spend more time focusing on friends and family during the holiday season, and less time worrying about fixing your heating equipment. Up to 40 percent of heating system problems during the fall and winter are the result of poor maintenance. If you host guests for the holidays, your heating equipment will work harder to maintain comfortable temperatures. Naturally, increased run times increase the likelihood of failures. To improve the reliability of your HVAC system throughout the season, call an HVAC specialist to clean and adjust its components—as many breakdowns are the result of dirty equipment— and fix minor issues before they become expensive problems. other components to ensure the HVAC system runs optimally. Maintain the warranty: When you purchase HVAC equipment, you also pay for the benefits outlined in the system’s warranty. If you read the fine print, you’ll find that many manufacturers require owners to schedule annual HVAC tune-ups to maintain the warranty. Failing to do so could void the warranty, making you responsible for all repairs and replacements. Extend the HVAC system’s life: If you never take a car to a mechanic for a tune-up and oil change, your car may eventually require major repairs. The same is true of an HVAC system. Heating and cooling equipment is a major investment in your home with a lifespan of up to 20 years. The longer you keep the HVAC system in good shape, the longer it will last, which can translate into significant financial savings. Improve the quality of air in your home: Air pollution levels inside a home or building can be considerably higher than the levels outside. Annual HVAC maintenance and monthly air filter replacements can ensure the air in your house breathe is healthy, clean, and free of toxins and allergens. This is particularly important if an individual has allergies or asthma. If your HVAC equipment runs on natural gas, the specialist will inspect for carbon monoxide leaks and ensure the exhaust system works properly. Protect your home: When a heating system fails during the winter, it is more than a frustrating inconvenience. Cold temperatures put the individuals in your home at risk of exposure-related illnesses. Additionally, cold temperatures increase the risk of burst pipes, as frozen water expands, cracking pipes and causing water damage. Keeping your HVAC system in good shape is an essential component to winterizing your home and preventing unexpected disasters. Winter is one of the busiest seasons for heating and cooling professionals. When you schedule an HVAC tune-up in early fall with an AAA Heating and Cooling specialist, you will be able to choose from a greater selection of convenient appointment times. This way, you ensure your heating equipment is performing correctly and you avoid being left in the cold during the busiest time of year! Schedule your fall HVAC tune-up with AAA Heating and Cooling today.